2200VA on-line, double-conversion UPS system for critical server, network and telecommunications equipment. 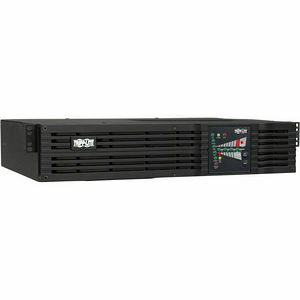 2U rackmount form factor with an installed depth of only 483 mm. Full-time sine wave 200/208/220/230 or 240V +/-3% output. Online, double-conversion UPS actively converts raw incoming AC power to DC, then re-converts output back to completely regulated, filtered AC output. Operates continuously without using battery power during brownouts to 130V and overvoltages to 275V. C20 inlet input connection; 2 C19 and 4 C13 output receptacles. Network management interfaces support simultaneous communications via USB port, DB9 serial port and SNMPWEBCARD slot. HID-compliant USB interface enables integration with built-in power management and auto shutdown features of Windows and Mac OS X. Includes PowerAlert monitoring software and complete cabling. 3-stage metered current monitoring and battery charge status LEDs. Dataline surge suppression for dialup, DSL or network Ethernet connection. Ideal for protection of critical equipment in server rooms, internetworking closets and telecommunications systems in rackmount or tower applications. Common applications include corporate or departmental servers, workstations, hubs, routers, bridges, CAD/CAM workstations, concentrators, IP telephony and traditional PBX switching systems.